(1:48 p.m. EDT) -- Passengers onboard Royal Caribbean's Grandeur of the Seas are frazzled but unhurt after an early-morning fire forced them out of bed and to their muster stations for several hours Monday morning. The fire, which started at 2:50 a.m., was extinguished by 4:58 a.m. According to Cynthia Martinez, Royal Caribbean Cruise Line's director of global corporate communications, passengers were mustered at their assembly stations in "an abundance of caution." "All 2,224 guests and 796 crew have been accounted for," Martinez said. Royal Caribbean has not commented on the cause of the fire. Though no serious injuries were reported, medical staff responded to a number of calls including reports of passengers fainting, having high blood pressure and one sprained ankle, according to the cruise line. 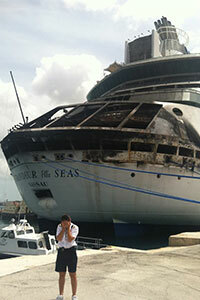 Martinez told Cruise Critic the fire was located in the mooring area of deck 3. But damage was not limited to this area. "Some cabins sustained water or smoke damage," she said. "The guests in affected staterooms will be put up in hotels in Freeport this evening." All other passengers have been allowed to return to their staterooms, and most public areas are open. Families of passengers can call a dedicated hotline for information at (888) 824-0012 or (408) 916-9000. Scheduled to call on CocoCay today, Grandeur of the Seas instead sailed to Freeport, Bahamas, where it is undergoing evaluations. Royal Caribbean's president and CEO Adam Goldstein is in Freeport to meet with passengers and to inspect the ship. The ship will be staying over at least one night in Freeport. Cruise Critic member Dharma517 who is onboard Grandeur of the Seas reported a Coast Guard plane was circling the ship as crew fought the fire. "And Carnival Sensation was called to stand by. We could see it lit up in the distance. This was scary." Grandeur of the Seas was on a seven-night sailing that departed Baltimore, Maryland, on May 24, and includes port calls to Port Canaveral, CocoCay and Nassau. Photo courtesy of member smoosh21 who received it from a "crew member friend".